This is often how I get my topics. During the latest home project I came across a bunch of stuff I haven’t seen in ten years, or more. Like my floor safe. And my pencil sharpener. One time I did vintage soap ads because I had a brick of Ivory soap on the table. Explore H is for Home&apos;s photos on Flickr. H is for Home has uploaded 3255 photos to Flickr. Vintage 1970&apos;s Brother Electric Pencil Sharpener by joevintage . Nice link. 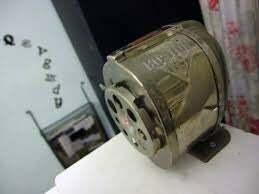 Antique pencil sharpeners.